The city hasn't threatened Susan Reitman with jail, but it has ordered her to remove the signs because they are too large, and the rules allow for only one. ROCKLAND — A 75-year-old Rockland woman says she would rather go to jail than follow a city directive to remove signs supporting President Trump. 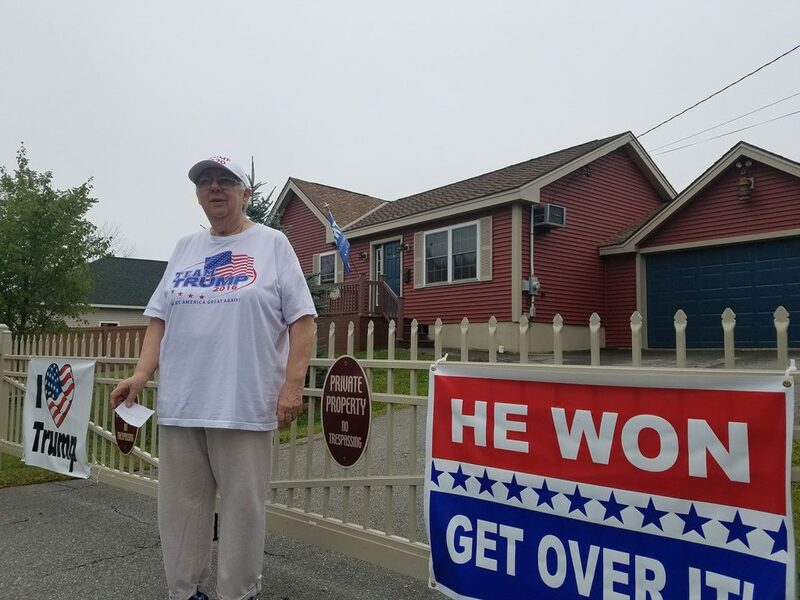 Susan Reitman has been directed to remove the pro-Trump signs because they exceed the size of signs allowed on residential properties, Rockland Assistant Code Enforcement Officer William Butler said. He said the directive has nothing to do with the signs’ content. “I admire your passion for our president. Truly, I do,” Butler said in a Monday email to Reitman. “However, we have received a complaint and I have to do my due diligence and I have determined your signs are not in compliance with the Rockland Code. There was no threat of jail mentioned in the email and the city would first need to file a land-use complaint in court. Jail would be a risk only if a judge ordered the removal of the signs and Reitman refused to follow the court order. The city’s sign ordinance limits residences to one sign, either one that is attached to a structure and is no more than 2 square feet or a free-standing sign of no more than 4 square feet. The gate to Reitman’s driveway has two signs that exceed the size limits, and she also has one on her ranch-style house on Seavey Lane, a dead-end road off South Main Street that has 10 homes. She said the assistant code officer had been on her property earlier this month about a request she had to add a fence and she was not told the signs were in violation at that time. Butler said he received an email complaint from a resident and that he was obligated to respond. He declined to release the name of the complainant, but said the identity would be released if a formal Freedom of Access Act request was made. The Courier-Gazette filed such a request Monday. Reitman said she would not remove the signs, despite the warning from the city. “They can put me in jail. I won’t take them down,” she said. The city ordinance carries a potential penalty of between $100 and $1,000 per day for violations. Reitman said she also will refuse to pay any fine and that the city can place liens on her property if it wants to. She said she is living on a fixed income. “I have the right to support our president. This is about freedom of speech,” she said. Rockland, which had a population of 7,179 in 2016 according to the U.S. Census, has 1,798 registered Democrats and 1,223 registered Republicans. Hillary Clinton won the city’s presidential vote in November, 58 percent to 35 percent for Donald Trump. Both of the state legislators representing the city, one in the House and one in the Senate, are Democrats. Reitman, who is retired and a widow, has lived in the home since 2006. Trained as a nurse, she last worked for Coastal Opportunities in Camden. Maine law allows campaign signs to be on the state road right-of-way six weeks before an election and one week after the vote. State law allows campaign signs on private property if they are not within a road right-of-way. State law, however, says that municipalities can impose stricter regulations. Reitman said that if the signs are within the road right-of-way she would move them to her house. However, Butler said that the law on campaign signs has no bearing on the situation and that he issued the directive because the signs violate the ordinance governing the size and number of signs on a residential property.